Like a wild animal, the soul is tough, resilient, resourceful, savvy, and self-sufficient: it knows how to survive in hard places. I learned about these qualities during my bouts with depression. In that deadly darkness, the faculties I had always depended on collapsed. My intellect was useless; my emotions were dead; my will was impotent; my ego was shattered. But from time to time, deep in the thickets of my inner wilderness, I could sense the presence of something that knew how to stay alive even when the rest of me wanted to die. That something was my tough and tenacious soul. Yet despite its toughness, the soul is also shy. Just like a wild animal, it seeks safety in the dense underbrush, especially when other people are around. If we want to see a wild animal, we know that the last thing we should do is go crashing through the woods yelling for it to come out. But if we will walk quietly into the woods, sit patiently at the base of a tree, breathe with the earth, and fade into our surroundings, the wild creature we seek might put in an appearance. We may see it only briefly and only out of the corner of an eye - but the sight is a gift we will always treasure as an end in itself. A circle of trust is a group of people who know how to sit quietly "in the woods" with each other and wait for the shy soul to show up... In such a space, we are freed to hear our own truth, touch what brings us joy, become self critical about our faults, and take risky steps toward change - knowing that we will be accepted no matter what the outcome. Parker J. Palmer, is a world-renowned writer, speaker and activist who focuses on issues in education, community, leadership, spirituality and social change. He has reached millions worldwide through his nine books, including Let Your Life Speak, The Courage to Teach, A Hidden Wholeness, and Healing the Heart of Democracy. Above is an excerpt from his book titled A Hidden Wholeness: The Journey Toward an Undivided Life. Seed questions for reflection: What do you understand by the term "circle of trust"? 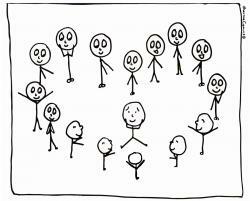 Can you share a personal experience of being in a circle of trust? What helps your shy soul "put in an appearance?" Learn how to do this at http://www.focusingresources.com. I love this concept of the Circle of trust. For me, it is firstly the desire to seek ad live in solitude for some part of daily living to first center oneself and keep that soul voice alive, regardless of joy or pain. This inner center should then hopefully be able to expand into a greater, inclusive, non-judgmental circle of trust, love, understandind and support.. Herein lies the foundations of real societies and communities. Full TRUST is very difficult to come by these days. People talk, chat, tweet, repeat, text . . . what they know. The more one "knows" (and can share) the more interesting one becomes. People talk for talking's sake. Story telling, expanding truth and lies has become the norm! It's no wonder my small mind cannot find "truth" (trust) within the muddle of "my world". This writing by Parker Palmer appears to have found his soul in pain and suffering, also finding his soul in a circle of friends who can sit quietly with. My experience of my soul is like an inner landscape. It resembles someone riding a bicycle on a beautiful day and enjoying everything about the flow of the experience. This inner world is this experience of effortless oneness and appears to come from being in union with others. The soul creates a whole picture rather than a particular part. Keeping this unity within existence appears to be this self-realization I need action to embrace life, rather than this internal zone where I feel safe, peaceful, comfortable, and I will not be disturbed by anything. My soul can daydream. It can be present without content and can be without meaningful awareness of others too. There is safety in my imagination. So to me the soul takes action and to see everything changing and growing, just as my soul grows and changes. The soul is like surrendering my familiar identity and moving into the dynamism of life. It is active role in making life harmonious for everyone. This action creates love and has a dynamic effect on the soul. It is like love melts down barriers and boundaries, constantly restoring awareness with this unity. The sense of separation dissolves and the brilliant light of Divine Love flows within, creating and sustaining everyone and everything. Circle of Trust is harmony of mind, body & soul. All three must have 100% trust in each other. When Thought, Intuition and Action are in the same wave length we are in the circle of trust. So also like minded souls can form a circle of trust. ...and the soul is there - but what happens when it is opressed by stronger forces in you, destructive and not able to listen to your positiv inner voice? Or in other words, why are there so many sucides - mainly men betwenn 19 - 25 and between 40 - 45 years? I thank God for your tough and tenacious soul!!! Circle of trust is a safe environment where one can share from their heart and soul and feel accepted and valued. I am fortunate to have several of these circles in my life & have relied on them in my own times of darkness. My soul is generally speaking a bit more open, yet when the darkness comes, the soul retreats and I am even more grateful for those who quietly enter space with me, sit listen and sometimes don't even say anything, simply offer their presence. Hugs to everyone, may we all be in quiet presence with each other. A circle of trust may consist of me, myself, and I, or it may be me and one other person, or it may be me and a group of people. At any rate, in a circle of trust, we are being still, probably being quiet much more than speaking. There's a saying about talking only when talking is an improvement over silence. And a saying that most of our problems come from our inability to sit alone in a room and be still. It's said that we communicate head to head, heart to heart, and soul to soul. An individual enjoys a circle of trust with himself or her self when he or she can quietly be with himself or herself, reflecting or meditating or being still, tuning in to his or her own soul, not thinking frenetically about things to do. Lovers can sit without talking for extended periods and simply be together appreciating each other, soul to soul. A group, probably a small group, can similarly be together, listening to one another, being open, respectful and caring with one another, not talking over one another. Those times, with myself or one other or a small group are peaceful and typically there is a good deal of quiet, and it is during such times that soul has space to put in an appearance, or be noticed since it is always there. I've had some such experiences and they are most satisfying, alive, intimate, connected. It's in those experiences that I learned what it means to feel metaphorically two feet off the ground.